During the first day's stretch to Sturgis, I managed to get myself branded with a heart shape symbol. I'm sure the first thing friends might be pondering upon seeing this picture is how this branding ceremony happened. 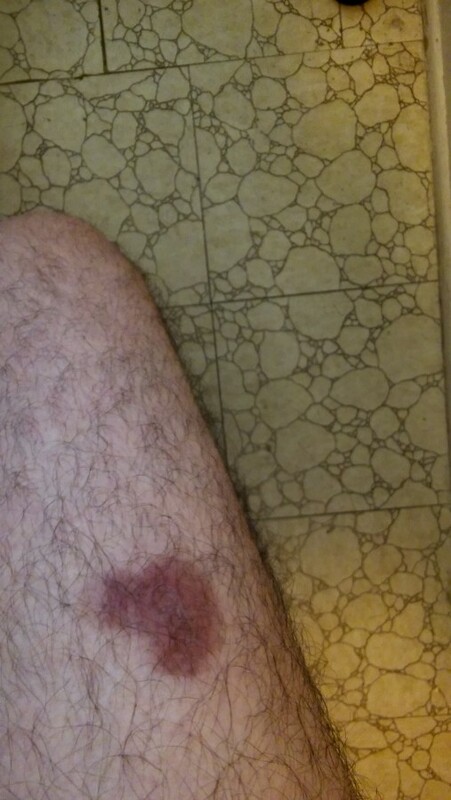 It wasn't something sneakily executed in my sleep, or a result of being passed out drunk while drinking buddies took a brandishing iron to my leg. The truth is, during the first leg of the trip, the hot desert sun was beating down on my leg as we crossed the California/Nevada desert. My Zippo lighter was in my front pants pocket leaking fuel because, since the wick was old and making it difficult to light, I over-filled it. It felt like a wasp had found it's way up my pants leg from having my feet on the highway pegs. But I knew there was something in my pocket which shouldn't be there. Afterwards, I picked up a nice leather Zippo holder that can be slipped thru my belt and the rest of the trip was painless.